All eyes and ears were on eMusic as it recently promoted concerts of up-and-coming artists on buildings in New York, Miami, Atlanta, Chicago and Los Angeles. 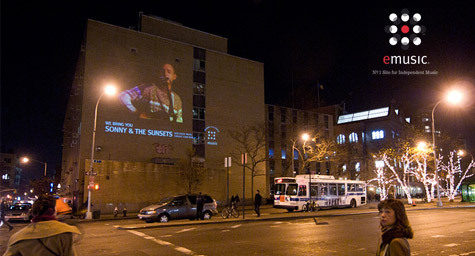 MediaPost.com reports that the subscription music service recently began a virtual road tour that projects concert footage of selected artists on the walls of buildings for passersby to enjoy. While the concerts play, brand ambassadors interact with viewers, pass out t-shirts and concert paraphenalia, and provide details on eMusic subscriptions. The virtual road tour began in December and runs through the end of March. The virtual tour features the bands Best Coast, Sonny and the Sunsets and No Age. These three bands were selected as emerging artists and subscriber favorites through eMusic’s recommendation engine. These artists are available for download from eMusic’s database. The campaign was a collaboration between eMusic’s digital agency, Sarkissian Mason, and its media agency, TargetCast tcm. The tour has been promoted through Facebook, Twitter, music industry bloggers and local market newspapers. The tour stays in each city for a two-week period, playing in multiple locations for maximum reach. The virtual road tour is literally opening people’s eyes to eMusic’s subscription service and making these new bands a sight to see. MDG Advertising, a full-service Florida advertising agency, with offices in Boca Raton and New York, NY, specializes in developing targeted Internet marketing solutions, exceptional creative executions and solid branding and media buying strategies that give clients a competitive advantage.Our core capabilities include print advertising, branding, logo design , creative, digital marketing, media planning and buying, TV and radio, public relations, Web design and development, email marketing, social media marketing and SEO. To view MDG’s portfolio, click here.